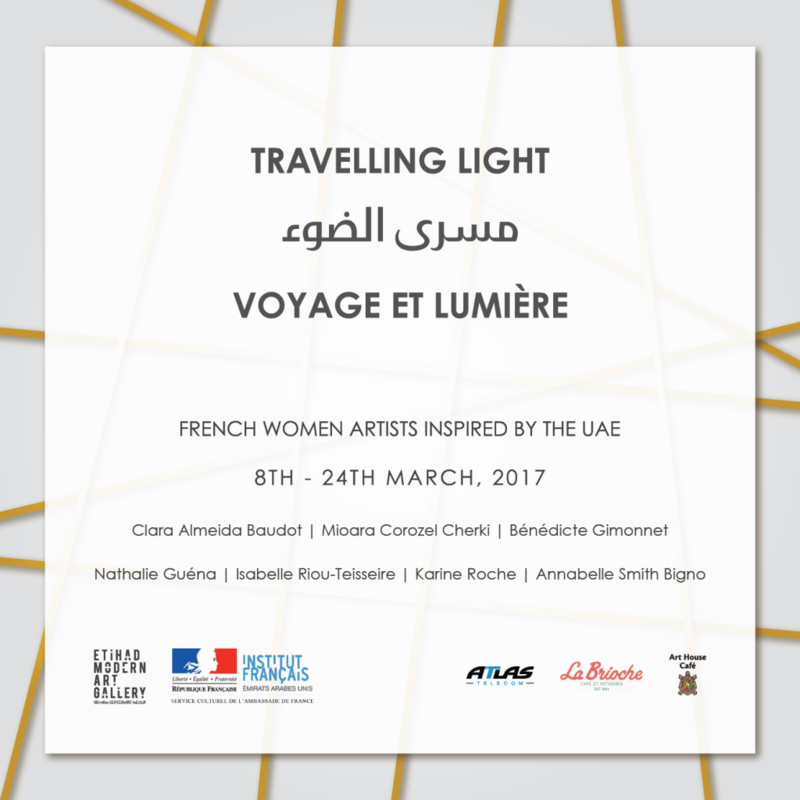 Travelling Light is a group exhibition of 7 French female painters living in the UAE. Their artwork in this show is an examination of the complexities, emotions and aesthetics of light. The full details of the exhibition can be found here. 1. How do you begin to paint a new piece? Do you have an idea of the end result when you put the first brushstroke on the canvas? Mioara Cherki: When I start painting, there are some elements to be met: the inspiration that gave me the subject, a long meditation about the subject and the technical process necessary to give it a body – it can stay for many months in my head – and the bang of inner energy that will make me put the first “knife stroke” on the canvas. Many times it was a sound, a song that I will listen to obsessively thousands of time until the work is done. Finally, the act of creating is a kind of trance, anyway I feel transported behind the first layer of reality, like daydreaming. I always know what I want to do when I start a new work as it is already “ripe” – “mûr” in French – but I am open and delighted to embrace the unexpected and the dance of hazard in my work. Nathalie Guena: I only know the colours I want to work with. I put the colours on the knife and start like a sculpture. I never know how it will be at the end. Bénédicte Gimonnet: A new piece is always part of a series of works, a ‘wide’ project, thoroughly planned, sketched, and conceptualised in sketchbooks. Ideas are inspired from memories, places and moments, a very personal journey and process. And then comes the time I actually start the piece as planned first, but then of course I let it evolve, mature and transform itself, so the final version is always a mix of chance and control. That’s what is interesting about it. 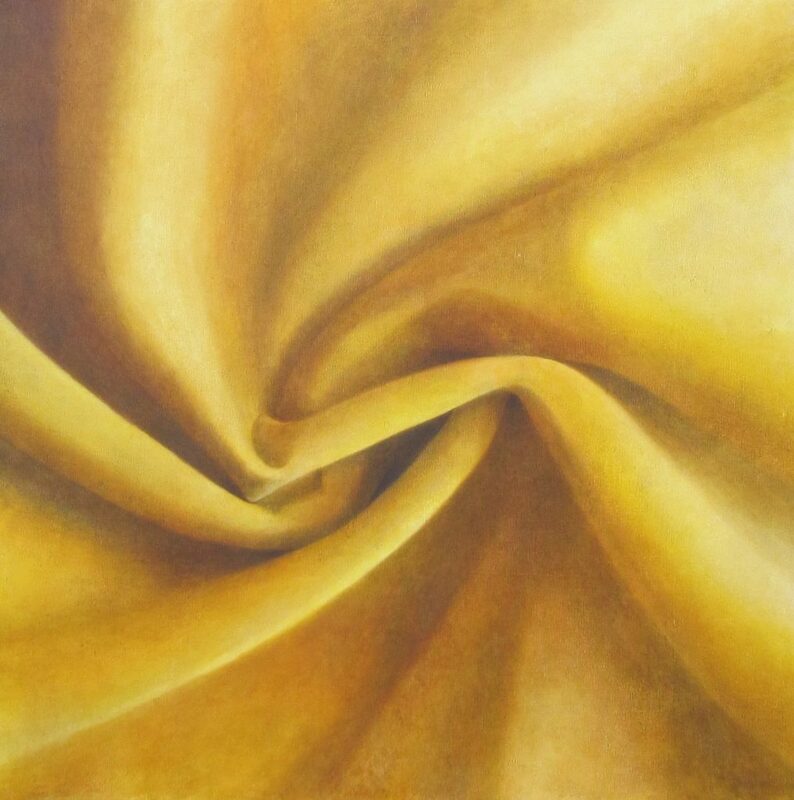 Annabelle Smith: Yes I do but the result is often shaped by the effects of the flow and diffusion of water and pigment on the canvas – a process which is key in my work. Clara Baudot: When I start a new piece I never know what I am going to do. I start with a feeling with the colours, depending on the day. My paintings are figurative, but I always start like an abstract painting, and every time the purpose is to be fine and enjoy colours. After my abstract is finished, something is missing, I need to go far. And it depends on how the abstract talks to me and maybe I add a figurative subject. 2. Is it difficult to finish a painting and leave it alone, saying to yourself, that is completely finished now? Bénédicte Gimonnet: This is the hardest thing for a painter, knowing when to stop a project. With experience and years, you get a sense of that, knowing when a piece has reached its ultimate version, improving it until the point you may ruin it. So yes, as I am a perfectionist, I find it really difficult to stop when my inner voice pushes me to carry on! Clara Baudot: To me the painting is never finished. Maybe because I change my technique so often. And something which was almost perfect yesterday, the day after seems to me not good at all. Annabelle Smith: Yes this is always a challenge; whether to leave a canvas fresh and minimalistic or push it all the way to a more complex result. 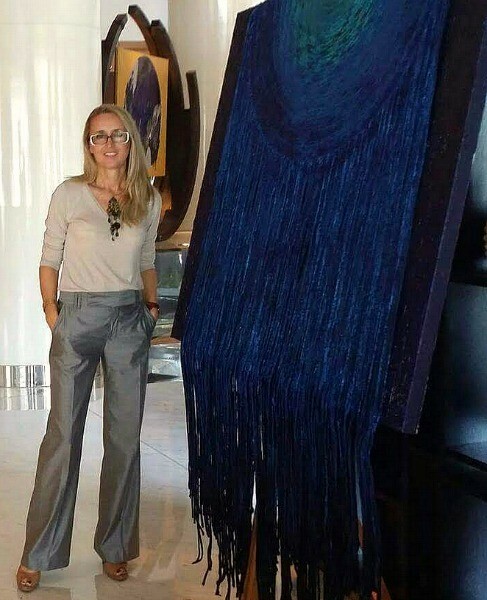 Nathalie Guena: Sometimes a painting can stay one year on an easel before it is finished. 3. Where do you find the inspiration for painting? Bénédicte Gimonnet: I draw my ideas from my personal memories of places and very specific moments I associate to a particular colour palette and materials (resin, ink, enamel, Perspex, Aluminium..). I take many photographs where I live or when I travel, collect any images relevant to my ideas and visit as many art exhibitions as I can, from, classical, modern to contemporary. 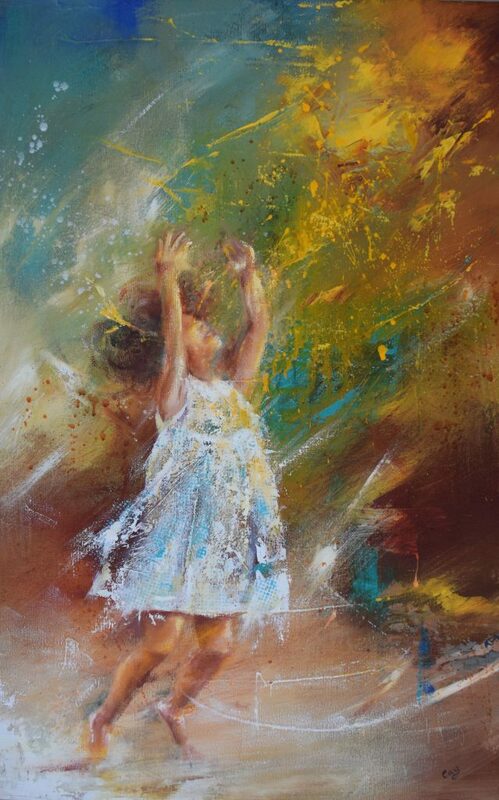 Annabelle Smith: In the flow of energy that surrounds us – the wind, a flock of birds, the spontaneity of a child or poise of a human form… an energy field which is beyond perceived form and which provides infinite inspiration for abstract portrayal. 4. Which artist do you admire the most and why? Karine Roche: It’s impossible to answer. There are too many artists I have admired at all ages. The list would be too long. I can’t choose one. They are sort of shaman, they are guides. They arrived to put their life in their art and it’s become something almost universal. They touch something near the creation of a cosmos. They do a microcosm as a macrocosm. Clara Baudot: I admire Klimt, a lot, for sure. The colours in Klimt paintings are strong and complex. The beauty of his subjects and his questioning about life are an inspiration. Nathalie Guena: Leonor Fini is the artist who captures the female sensibility and someone I admire artistically. 5. The exhibition opens on Women’s Day. Do you think that your femininity shows in your artwork? Why or how? Karine Roche: It’s not something I want absolutely. It’s possible though because I paint flowers and I use fabrics and lace in my painting, but it’s not a specific theme and matter for women! Annabelle Smith: Yes – in this series women abound – in semi-abstract form. Women play a vital but often silent role in today’s world. That is why my series is called No Words. We can’t always hear them but their presence is a buffer to the violent egocentric and often male-generated violence. Mioara Cherki: This series shown in Travelling Light Exhibition it is a work about the travel of our inner light through the creative act. Living in this country, a so young and sophisticated one, I had to come back to the tactile memory of the simple gesture of knitting, made by women from the beginning of humanity. I approached women originating from small villages near Abu Dhabi to practice their traditional knowledge in a world where we look at them like they are relics in a museum instead of learning the ancestral ways of living in harmony with the environment. My work is dedicated to all these humble women who may feel lost in this artificial world. 6. In terms of equality, in your opinion, is it easier for a man to be a successful fine artist than a woman? Karine Roche: The answers are in the museums, but it’s only been less than 100 hundred years that the school of beaux-arts has given the same artistic education to women and men. 7. What would you like the viewer to feel when they see your work in the Travelling Light exhibition? Bénédicte Gimonnet: I would like the viewer to dive into my world of chromatic waves and vibrations and let his imagination bring him on an emotional journey determined by colours. And when he comes closer to the painting, I would like him to discover all the work behind the layering process and use of materials, feel the physicality of the painting and be drawn into it. Karine Roche: I would like them to forget about their everyday life and to look at other perspectives taking the time to feel and appreciate art everywhere. Clara Baudot: For this series of children I did, I would like the viewer to feel the tenderness of childhood and never want to lose this purity. Annabelle Smith: A connection with the artwork which goes beyond the conventional or representational – like an emotion.